Genetic models have been developed in divergent branches of the class Alphaproteobacteria to help answer a wide spectrum of questions regarding bacterial physiology. For example, Sinorhizobium meliloti serves as a useful representative for investigating rhizobia-plant symbiosis and nitrogen fixation, Caulobacter crescentus for studying cell cycle regulation and organelle biogenesis, and Zymomonas mobilis for assessing the potentials of metabolic engineering and biofuel production. A tightly regulated promoter that enables titratable expression of a cloned gene in these different models is highly desirable, as it can facilitate observation of phenotypes that would otherwise be obfuscated by leaky expression. We compared the functionality of four promoter regions in S. meliloti (P araA , P tauA , P rhaR , and P melA ) by constructing strains carrying fusions to the uidA reporter in their genomes and measuring beta-glucuronidase activities when they were induced by arabinose, taurine, rhamnose, or melibiose. P tauA was chosen for further study because it, and, to a lesser extent, P melA , exhibited characteristics suitable for efficient modulation of gene expression. The levels of expression from P tauA depended on the concentrations of taurine, in both complex and defined media, in S. meliloti as well as C. crescentus and Z. mobilis. Moreover, our analysis indicated that TauR, TauC, and TauY are each necessary for taurine catabolism and substantiated their designated roles as a transcriptional activator, the permease component of an ABC transporter, and a major subunit of the taurine dehydrogenase, respectively. Finally, we demonstrated that P tauA can be used to deplete essential cellular factors in S. meliloti, such as the PleC histidine kinase and TatB, a component of the twin-arginine transport machinery. The P tauA promoter of S. meliloti can control gene expression with a relatively inexpensive and permeable inducer, taurine, in diverse alpha-proteobacteria. Regulated expression of the same gene in different hosts can be achieved by placing both tauR and P tauA on appropriate vectors, thus facilitating inspection of conservation of gene function across species. The class Alphaproteobacteria encompasses a multitude of noteworthy taxa with diverse physiologies. Members of the group range from human and livestock pathogens, such as Rickettsia and Brucella, to rhizobial species, such as Sinorhizobium meliloti and Agrobacterium tumefaciens (also known as Ensifer meliloti and Rhizobium radiobacter, respectively), that benefit or damage agricultural crops . The possible progenitor of present-day mitochondria, and several highly abundant marine groups, including Roseobacter, SAR116, and SAR11, also belong to this class . In-depth molecular studies of various representatives have led to significant insights regarding cell cycle progression , organelle biogenesis , metabolic pathways , microbe-host interactions ,, and potential for biofuel production . The availability of genetic tools in readily culturable bacteria facilitates the investigation of their physiologies. In particular, an inducible promoter that allows tight titration of gene expression enables functional analysis of cellular factors that are toxic at low levels or essential for viability. For example, investigators working with Escherichia coli, a gamma-proteobacterium, possess an array of such tools at their disposal: some commonly used ones are the arabinose-inducible PBAD promoter ,, the rhamnose-inducible P rhaB promoter , and various derivatives of the original lac and tet promoters ,. Within the alpha-proteobacteria group, Caulobacter crescentus is perhaps one of the representative members most amenable to genetic manipulation, with two well characterized, regulatable promoters, inducible by xylose or vanillate -. Identification of these control elements has helped C. crescentus emerge as a prominent model for study of bacterial cell biology . In contrast, the agriculturally important alpha-proteobacterium S. meliloti, which forms mutualistic symbiosis with legume plants, lacks a selection of such fully developed induction systems. Following reciprocal exchange of chemical signals between a suitable plant host and the endosymbiont, S. meliloti infects and colonizes nodules that develop along the plant root; the bacteria enter membrane-bound compartments within cortical cells and differentiate into bacteroids, capable of converting atmospheric dinitrogen to ammonia ,. The ability of S. meliloti to fix nitrogen for its hosts, especially alfalfa, improves crop yield, reduces expensive reliance on synthetic fertilizers, and enriches soil fertility in an ecologically sound manner ,. Better tools for manipulating the bacterium would facilitate investigation of this model rhizobial-plant symbiosis. Our goal is to identify expression systems that can be modulated and efficiently shut off, thus permitting characterization of phenotypes that would otherwise be obscured by leaky expression. We are particularly interested in a system that is functional and easily transferrable among different alpha-proteobacteria. Derivatives of the E. coli lac promoter, inducible by isopropyl-beta-D-thiogalactopyranoside (IPTG), appear to serve this purpose ,. Nevertheless, additional candidates that would enlarge the repertoire of genetic tools deserve further examination. We chose to compare four potential promoter regions--P araA , P tauA , P rhaR , and P melA --each with varying degrees of prior characterization. We selected these candidates because (1) their respective inducers are relatively affordable; (2) previous studies suggested potentials for modulating gene expression by at least one order of magnitude; and (3) genomic integrations of transcriptional fusions to the promoters can be achieved easily without disrupting genes involved in the metabolic pathways under investigation. The P araA promoter region is located on the pSymB megaplasmid, upstream of the araABCDEF operon (Figure1A), which was shown to be required for arabinose catabolism and inducible by arabinose more than 100-fold in defined medium . However, expression may be subject to a certain degree of catabolite repression and inducer exclusion ,. P tauA , P rhaR , and P melA expression were tested in a large-scale screen for induction profiles of solute transporters and found to increase at least 100-, 6-, and 60-fold when cells were exposed to taurine (2-aminoethanesulfonate), rhamnose, or melibiose, respectively . Located on pSymB and upstream of genes thought to be involved in taurine assimilation (Figure1B) ,, the P tauA promoter region has allowed controlled expression of reporter genes in rhizobial and Rhodobacter species  and of the site-specific recombinase Cre in S. meliloti. The P rhaR promoter region is located upstream of rhaR, which encodes a transcriptional regulator, and between chromosomal genes involved in rhamnose metabolism (Figure1C) . The P melA promoter is located between agpT and melA on the pSymB megaplasmid (Figure1D); melA and downstream genes are required for assimilation of alpha-galactosides, such as raffinose and melibiose, while AgpT is an AraC-like transcriptional activator, required for induction of the P melA promoter ,. P melA has been used successfully in physiological studies of S. meliloti and as a biosensor for environmental galactosides , but catabolite repression and inducer exclusion by succinate and other preferred compounds can also affect its induction ,. Schematics depicting integration of plasmids into the S. meliloti genome to generate transcriptional fusions. Integration of (A) pJC445, (B) pJC446, (C) pJC447, and (D) pJC455 resulted in fusions of the uidA reporter to promoter regions upstream of araA (SMb20895), tauA (SMb21526), rhaR (SMc02323), and melA (SMb21648), respectively. The sizes of the regions that enabled homologous recombination are shown below each plasmid. gbpR, tauR, rhaR, and agpT represent potential or confirmed regulators of genes involved in arabinose (ara), taurine (tau), rhamnose (rha), or melibiose/alpha-galactoside (mel/agp) metabolism. White pentagonal blocks indicate genes without assigned function. We used transcriptional fusions to the genomic loci of these four promoters to assess their induction profiles in both complex and defined media. Our results suggested that P tauA and P melA offered both tighter regulation and wider ranges of expression compared to the other promoters. Further characterization of the P tauA promoter indicated that the surrounding tau genes are required for taurine metabolism and affect expression from the promoter. We demonstrate the utility of the promoter by showing that P tauA allows modulated expression of reporter genes in two other model alpha-proteobacteria, C. crescentus and Zymomonas mobilis. Moreover, we verified that P tauA enables tight shut-off and depletion of essential genes in S. meliloti. Thus, this study establishes the feasibility of using P tauA as a regulatory switch in diverse alpha-proteobacteria. To identify a promoter region that allows controlled expression of desired genes, we compared the levels of inducible expression from four different potential promoters: P araA , P tauA , P rhaR , and P melA . These regions were chosen according to the criteria described above after reviewing previously published studies for candidates. Each promoter region was transcriptionally fused to the uidA gene [encoding the beta-glucuronidase (GUS) reporter enzyme] on a suicide plasmid, which was subsequently integrated into the S. meliloti genome via homologous recombination (Figure1). We designed the constructs to minimize disruption of the target genomic regions, such that the surrounding genes and their regulation remained intact, by integrating between divergently transcribed genes. Strains carrying the reporter constructs were grown in complex (PYE, LB) or defined (M9, M9 + CAA) media for three hours to mid-log phase, with or without appropriate inducers: arabinose for P araA , taurine for P tauA , rhamnose for P rhaR , and melibiose for P melA . For comparison in M9 minimal medium, strains were first grown in M9 supplemented with glucose (M9G), washed with M9, and then grown for three hours in M9G or M9 plus inducer as the sole carbon source. Samples were subsequently harvested for measurement of GUS activities. All strains exhibited higher levels of reporter gene expression in the presence of their respective inducers (Figure2). For the P araA promoter region, the maximal change occurred in M9 minimal medium, with a 10-fold increase in expression. Much larger changes in expression were reported in a previous study, possibly for a couple of reasons: (1) the induction time was longer; and (2) the reporter gene was inserted into araF, which is involved in arabinose catabolism . Compared to other promoters, P araA showed the highest level of induced expression in all rich and defined media tested: PYE, LB, M9, and M9 plus casamino acids (M9 + CAA). However, P araA also showed relatively high levels of basal expression in the absence of arabinose. Basal expression was lowest in M9G (12 Miller units; Figure2C), but it was still significantly higher than the basal expression of other promoters. Thus, while the P araA promoter region is not suitable for tight regulation, it may serve as a useful tool for overexpression of desired genes. Comparison of promoter strengths in different culture media. 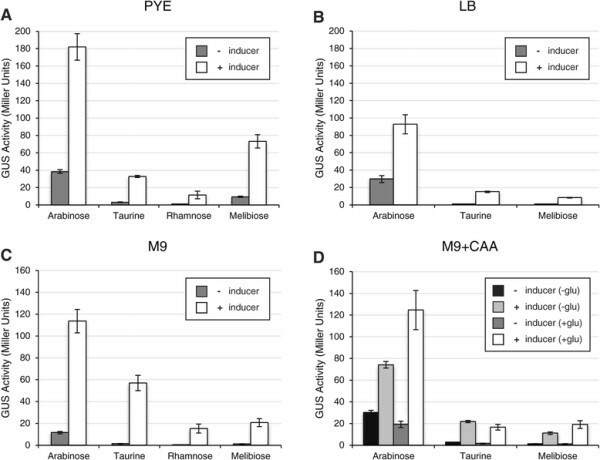 Strains (JOE3273, JOE3275, JOE3277, and JOE3334) carrying transcriptional fusions of uidA to arabinose-, taurine-, rhamnose-, and melibiose-dependent promoter regions were grown in (A) PYE, (B) LB, (C) M9, or (D) M9 plus casamino acids (M9 + CAA) liquid media for three hours, to mid-log phase, in the presence or absence of appropriate inducers. Cultures were then harvested to measure the levels of beta-glucuronidase (GUS) expression. For M9 + CAA, strains were either first grown in M9 + CAA without glucose (−glu) and then diluted into the same medium with or without inducer; or they were first grown in M9 + CAA supplemented with 0.2% glucose (+glu) and diluted into M9 + CAA supplemented with the inducer [+ inducer (+glu)] or glucose [− inducer (+glu)]. Error bars indicate the standard errors of the mean GUS activities. See Methods for further details. The P rhaR promoter demonstrated obvious elevation in expression when induced with rhamnose, increasing 10-fold (from 1.1 to 11 Miller units) in PYE complex medium and 38-fold (from 0.4 to 15.2 Miller units) in M9 minimal medium. However, P rhaR also showed the lowest levels of expression, whether induced or uninduced, when compared to other promoters under similar conditions. We only measured expression from P rhaR in PYE and M9 and did not test it in LB or M9 + CAA because other promoter regions all exhibited lower expression in LB compared to PYE and in M9 + CAA compared to M9. The results in PYE and M9 media had already suggested that the rhaR promoter region would not permit regulating genes that require high levels of expression. The remaining two promoter regions, P tauA and P melA , showed significant increases in GUS activities when induced. For P tauA , the increase ranged from 8-fold in M9 + CAA to 41-fold in M9, while for P melA the increase ranged from 8-fold in PYE to 19-fold in M9. Both demonstrated low levels of basal expression and robust expression when induced. The notable exception occurred for P melA in PYE, which exhibited higher levels of basal expression, suggesting leakiness in that particular medium (Figure2A). Nevertheless, both P tauA and P melA emerged as useful candidates for modulating expression of desired genes. In addition to melibiose (6-O-α-D-galactopyranosyl-D-glucose), we had also tested raffinose [O-α-D-galactopyranosyl-(1 → 6)-α-D-glucopyranosyl α-D-fructofuranoside] as a potential inducer for the P melA promoter region. Unlike melibiose, raffinose led to very little change in reporter gene expression during the three-hour induction period in all media tested (Figure3A; data not shown). Because this result contrasted with previous reports of raffinose as an inducer of melA and agpA expression ,, we examined induction of P melA more closely in PYE. Induction occurred when the reporter strain carrying P melA -uidA was grown with raffinose or melibiose for 20hours to stationary phase, with melibiose leading to stronger induction (Figure3B). When the strain was grown with raffinose or melibiose for 12hours, raffinose induced GUS expression if the culture reached stationary phase but not if the culture was maintained in log phase, whereas melibiose induced expression in either case (Figure3C). Catabolic repression has been shown to influence induction of P melA by raffinose ,, but melibiose seems to bypass this regulation in PYE rich medium. Therefore, raffinose appears to act as an inducer of the P melA promoter in complex medium only if the culture reaches stationary phase, while melibiose is a more versatile inducer. Induction of P melA promoter with melibiose (Mel) or raffinose (Raf). Strain JOE3334, which carries the P melA -uidA reporter fusion, was grown in PYE rich medium and induced for (A) 3hours, to mid-log phase; (B) 20hours, to stationary phase; or (C) 12hours, to mid-log or stationary phase. Error bars represent standard errors of the mean GUS activities. See Methods for further details. Because P tauA exhibited low levels of basal activity and a potentially more dynamic range of expression compared to other promoter regions, we characterized it further. The reporter strain carrying the genomic P tauA -uidA fusion was used to monitor expression over a range of taurine concentrations, following a three-hour induction period, in both PYE (Figure4A) and M9G (Figure4B). The levels of expression exhibited clear dosage-dependent responses in both media. In PYE, the promoter approached maximal expression at 90 to100 mM taurine. (We did not use concentrations above 100mM because adding higher levels of taurine to the medium became impractical, as its aqueous solubility is 500mM.) Expression increased from 1.5 to 175 Miller units, a 117-fold change. In M9G medium, expression became saturated by 5mM taurine. The range of expression was smaller, from an average of 1.0 to 52 Miller units, a 52-fold change. These results indicated that the P tauA promoter exhibits a wide range of expression in both defined and complex media. Dose-dependent expression of the genomic P tauA - uidA reporter fusion. Strain JOE3275 was grown for 3hours, to mid-log phase, in (A) PYE rich medium or (B) M9 plus 0.2% glucose (M9G) defined medium containing increasing concentrations of taurine and assayed for beta-glucuronidase (GUS) activity. (In contrast to the experiment described in Figure2C, in which M9 contained taurine as the sole carbon source during induction, the M9 media in this experiment contained both glucose and taurine during induction.) Error bars indicate the standard errors of the mean GUS activities. Next, we examined the effects of representative genes in the tau region (tauR, tauC, and tauY) on P tauA expression. tauR (SMb21525) encodes a transcriptional regulator of the GntR family, tauC (SMb21528) encodes the permease component of a probable taurine ABC transporter, and tauY (SMb21529) encodes the large subunit of the putative taurine dehydrogenase ,. Genetic analyses suggested that orthologs of the TauABC transporter in E. coli and Rhodobacter capsulatus participate in taurine utilization -. Also, previous studies indicated that the TauR ortholog in R. capsulatus (49% identity, 62% similarity, 0% gap ) activates expression of genes necessary for taurine dissimilation , and S. meliloti P tauA requires its cognate TauR for expression in Rhizobium leguminosarum. We expected similar behaviors in S. meliloti. We first constructed strains with individual in-frame deletions of tauR, tauC, or tauY and tested their ability to utilize taurine as the sole carbon and energy source (Figure5A). The Rm1021 wild-type strain formed visible colonies on M9 minimal medium supplemented with taurine after five to seven days of incubation at 30C, whereas all three tau mutants failed to exhibit detectable growth. Thus, tauR, tauC, and tauY are each required for taurine dissimilation in S. meliloti. Growth was restored when each mutant was complemented with the appropriate gene on a plasmid, suggesting that the individual deletions did not deter expression of downstream genes; i.e., they were not polar mutations. Effects of representative tau mutations on taurine metabolism and P tauA expression. (A) S. meliloti Rm1021 wild-type and tau mutants were grown on M9 minimal medium supplemented with 100mM taurine as the sole carbon source. Plate images, captured after 7days of incubation at 30C, are shown on the left, while strain genotypes are shown on the right. Strains used were Rm1021, JOE3844, JOE3846, and JOE3848; plasmids used were pJC478, pJC479, pJC538, and pJC539. (B) Expression of a plasmid-borne P tauA -uidA reporter was assessed in Rm1021 wild-type and tau mutant backgrounds in PYE rich medium. Strains with reporter plasmids containing or lacking the tauR gene (+ or - p-tauR) were grown in PYE with or without 10mM taurine (+ or - inducer). Error bars represent standard errors. Strains used were Rm1021, JOE3844, JOE3846, and JOE3848; plasmids used were pJC478 and pJC479. Wild-type strains carrying plasmids without the uidA gene (pJC472 or pJC473) exhibited negligible levels of GUS activity (<0.1 Miller units; data not shown). (C, D) Dose-dependent expression of a plasmid-borne P tauA -mCherry reporter was measured in (C) PYE and (D) M9G media. Strains were grown for 20hours in PYE or M9G supplemented with different concentrations of taurine. Wild type carrying the vector (pBBR1 MCS-2) was used to determine background fluorescence levels. Error bars represent standard errors of the mean of at least five biological samples. Strains used were Rm1021, JOE3844, JOE3846, and JOE3848. To assess the effects of the tau deletions, we used two similar plasmids carrying the P tauA -uidA reporter fusion, one with tauR also on the plasmid (pJC479), and the other without (pJC478). Wild-type and mutant strains transformed with the plasmids were grown in PYE in the presence or absence of taurine for three hours and then harvested to measure gene expression (Figure5B). Except for the ΔtauR mutant, all strains showed similar patterns of expression with both reporter plasmids: low basal activities in the absence of taurine and high levels of expression when induced. The ΔtauR mutant exhibited induction when tauR was present on the reporter plasmid but no induction when tauR was absent, confirming that TauR is the transcriptional activator for the P tauA promoter, as previously shown . Behavior of the ΔtauC mutant was indistinguishable from that of the wild type, suggesting that the ABC transporter is not required for taurine to enter the cell in complex medium. Finally, whether induced or uninduced, the ΔtauY mutant displayed the highest levels of reporter expression compared to other strains grown under similar conditions. These results are consistent with an increased accumulation of taurine, and thus enhanced expression, in the ΔtauY mutant due to its inability to degrade the sulfonate compound. Higher basal expression may be attributed to low levels of taurine in the PYE complex medium itself. Somewhat unexpectedly, deletion of tauC, which encodes a component of the putative taurine transporter, did not affect P tauA expression in PYE medium; because tauC is required for taurine utilization (Figure5A), we decided to assess the effects of the tau mutations over a range of inducer concentrations in both complex and defined media. To facilitate measurement of promoter activity, we generated a plasmid bearing tauR as well as a P tauA -mCherry reporter fusion. Wild-type and deletion strains carrying the plasmid were grown for 20hours with different concentrations of taurine in PYE or M9G prior to measurement of mCherry fluorescence. For all strains in PYE rich medium (Figure5C), an increase in fluorescence directly correlated with an increase in taurine concentration. As expected, since the tauR mutation is complemented by a copy of tauR on the plasmid, the wild-type Rm1021 and ΔtauR strains behaved similarly. Moreover, in agreement with the GUS assay results (Figure5B), the ΔtauY mutant exhibited much higher levels of expression compared to the other strains, reaching saturation at relatively low levels of inducer (1020mM taurine). The ΔtauC mutant displayed slightly lower expression of P tauA -mCherry compared to the wild type, with the difference becoming more noticeable at higher concentrations of taurine. 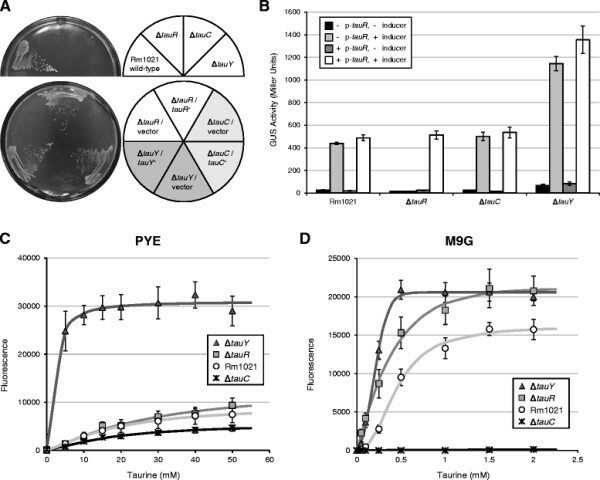 This subtle difference in expression suggests that while TauC and its associated ABC-type transporter are not absolutely required for taurine import in complex medium, they may enhance the process. In contrast, TauC is required in M9G minimal medium for import of taurine to induce P tauA expression. Only basal levels of fluorescence were observed with the ΔtauC mutant, regardless of taurine concentration, compared to the wild type and other tau mutants, where fluorescence correlated with increasing taurine concentration (Figure5D). Similar to results obtained with the GUS reporter (Figure4B), wild-type Rm1021 required much lower levels of taurine to achieve full induction in M9G compared to PYE. The ΔtauY mutant again exhibited the highest levels of expression. Intriguingly, in M9G medium the ΔtauR mutant showed consistently higher expression relative to wild-type Rm1021 and reached levels similar to that of the ΔtauY mutant at higher taurine concentrations. We do not have a clear explanation for this observation. The Rm1021 strain actually carries two copies of tauR (one genomic, one plasmid-borne) and should activate expression more readily than the ΔtauR mutant, which only has one copy of the transcriptional regulator gene on the plasmid. One possibility is that genomic deletion of tauR influences expression of surrounding genes, such as reducing the levels of taurine dehydrogenase, and thus affects expression from the reporter plasmid. Taken together, our results indicate that tauR encodes a transcriptional activator necessary for expression from the P tauA promoter. TauY is involved in the degradation of taurine, most likely by forming part of the taurine dehydrogenase. The ABC transporter that contains TauC is required to import taurine in minimal, but not complex, medium. We speculate that the ABC transporter encoded by SMc02829-2832 serves as an alternative taurine uptake pathway in complex medium, because SMc02832 expression is induced by taurine, valine, isoleucine, and leucine . To explore the usefulness of the P tauA promoter in other alpha-proteobacteria, we investigated its dependence on taurine for expression in C. crescentus, a model system for studying bacterial cell cycle progression and organelle biogenesis . Wild-type NA1000 carrying reporter plasmids with the P tauA -uidA fusion were harvested for GUS assays after two hours of growth in PYE medium with or without taurine. When the reporter plasmid also contained tauR (pJC479), GUS activity was high in the presence of taurine and low in its absence, indicating induction (Figure6A, +TauR). When the reporter plasmid lacked tauR (pJC478), GUS activities remained low regardless of taurine concentration (Figure6A, −TauR). These results confirmed that TauR is necessary to activate expression from the P tauA promoter. Furthermore, C. crescentus does not have a functional homolog to substitute for S. meliloti TauR. 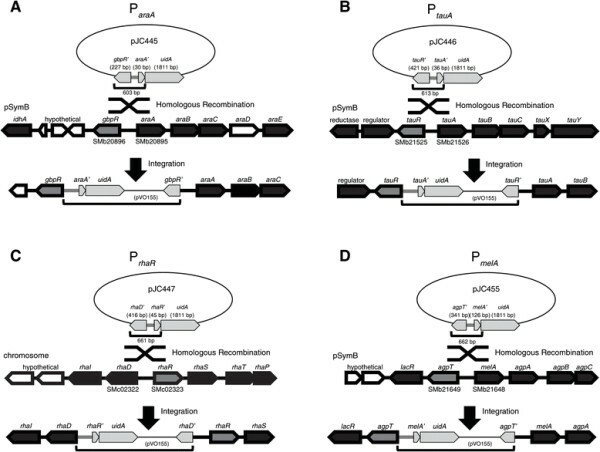 Expression of plasmid-borne transcriptional fusions to P tauA in C. crescentus NA1000. (A) NA1000 carrying P tauA -uidA reporter plasmids, without or with tauR (pJC478 or pJC479, respectively), were grown for two hours in PYE rich medium without or with 10mM taurine and assayed for GUS activity. (B) NA1000 carrying pJC479 was induced for two hours with increasing concentrations of taurine in PYE. Wild-type strains carrying plasmids without the uidA gene (pJC472 or pJC473) exhibited negligible levels of GUS activity (<0.1 Miller units; data not shown). (C, D) P tauA -mCherry expression level depends on taurine concentration in (C) PYE rich medium or (D) M2G defined medium. NA1000 carrying pJC503 was induced for four hours with increasing concentrations of taurine and assayed for fluorescence. Fluorescence values were adjusted by subtracting the background fluorescence of a strain carrying the vector pRVMCS-5. Error bars represent standard errors of the mean of at least six independent measurements. The same P tauA -uidA reporter strain (with tauR) was used to determine the possible range of expression in PYE medium (Figure6B). GUS activity increased with taurine concentration and reached maximum at approximately 10mM taurine. Thus, much lower levels of the inducer were needed to saturate the P tauA expression system in C. crescentus relative to S. meliloti. Expression varied approximately 19-fold, from 150 to 2800 Miller units. 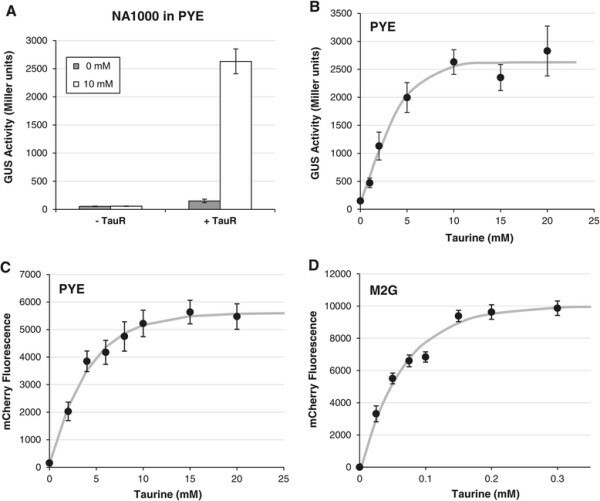 Similar results were obtained using a reporter plasmid carrying tauR-P tauA -mCherry: fluorescence levels increased with taurine concentration and approached maximum at 10mM taurine in PYE (Figure6C) and 0.15mM taurine in M2G minimal medium (Figure6D). Therefore, the P tauA promoter should be useful for modulating gene expression in C. crescentus. We also examined P tauA expression in a more distantly related alpha-proteobacterium, Z. mobilis, which possesses notable ethanol production properties of particular interest for biofuel synthesis . Wild-type ZM4 carrying tauR-P tauA -mCherry on a plasmid were grown in RM complex or BM defined media with increasing concentrations of taurine. Fluorescence measurements yielded trends similar to those observed in S. meliloti and C. crescentus. First, increases in fluorescence correlated with increases in taurine concentrations in both RM (Figure7A) and BM (Figure7B) media. Second, the expression system approached maximal induction at lower taurine concentrations in defined medium (15mM taurine in BM) compared to complex medium (50mM taurine in RM). Thus, the P tauA promoter can regulate gene expression in Z. mobilis. Moreover, because we observed taurine-dependent expression in both C. crescentus and Z. mobilis, which belong to different phylogenetic orders (Caulobacterales and Sphingomonadales, respectively), the P tauA promoter from S. meliloti (of the order Rhizobiales) may serve as a convenient genetic tool in divergent members of the class Alphaproteobacteria,. Dose-dependent expression of a plasmid-borne P tauA - mCherry reporter in Z. mobilis . Strains carrying pJC514 were grown for 20hours in (A) RM rich medium or (B) BM basal medium supplemented with increasing concentrations of taurine and assayed for mCherry fluorescence. Wild-type ZM4 carrying the vector (pBBR1 MCS-2) was used to determine and subtract the background fluorescence levels. Error bars represent standard errors of the mean of at least four independent biological samples. To demonstrate the utility of the P tauA promoter, we constructed showcase S. meliloti strains that allowed depletion of cellular factors essential for viability. Essential genes were placed under the control of the P tauA promoter, which enabled expression in the presence of taurine and shut off expression in its absence. The first example we chose was pleC, encoding a conserved histidine kinase required for cell division in S. meliloti. The 5 portion of pleC was transcriptionally fused to P tauA on a suicide plasmid, which was subsequently integrated into the native pleC locus via homologous recombination, such that the only intact copy of pleC is regulated by P tauA (Figure8A). The resultant strain (JOE3601) has already been shown to require taurine for viability  and is included here for comparison. Another depletion strain (JOE3608), in which the only copy of pleC is under the control of P tauA on a plasmid, also exhibited a similar dependence on taurine for growth . Schematics depicting integration of plasmids into the S. meliloti chromosome to generate depletion strains. Integration of (A) pJC468 or (B) pJC470 placed the only intact copy of pleC or tatB, respectively, under control of the P tauA promoter. The sizes of the regions that enabled homologous recombination are shown below each plasmid. The second example we chose was tatABC, three contiguous genes that encode essential components of the twin arginine transport system in S. meliloti. We took an approach similar to that for pleC. Because tatA is relatively small in size, and we wanted >500bp of homology for efficient recombination, both tatA and the 5 portion of tatB were fused to P tauA on the suicide plasmid. The resultant depletion strain has tatABC under control of P tauA , but also an intact copy of tatA under control of its native promoter (Figure8B). Presumably TatB and TatC are depleted in this strain when expression is blocked in the absence of taurine. The PleC and TatB depletion strains grew normally, similar to wild-type, in the presence of taurine in PYE rich medium but stopped duplicating when grown in medium lacking taurine (Figure9). The PleC depletion strain began slowing its growth 600minutes (10hours) after shifting into medium without taurine, and halted approximately 1320minutes (22hours) after the shift. The TatB depletion strain showed slower growth 960minutes (16hours) after medium shift and stopped growing also after approximately 1320minutes. In contrast, wild-type Rm1021 displayed typical doubling regardless of taurine availability, except that the presence of taurine seemed to stimulate slightly more robust growth, most likely due to its use as a nutritional source. These results indicate that the P tauA promoter can exert tight control over the expression of essential genes and facilitate studies of physiological consequences when vital cellular components are depleted. Representative growth curves showing depletion of PleC and TatB. (A) PleC depletion (JOE3601), (B) TatB depletion (JOE3604), and (C) wild-type Rm1021 strains were grown in PYE rich medium without or with 100mM taurine. Absorbance at 600nm (OD600) was used to monitor the growth of cultures, and measurements were adjusted accordingly when cultures were diluted to maintain growth in log phase. Together with previously published results ,, our analysis demonstrates that the P tauA promoter of S. meliloti Rm1021, when paired with its cognate transcriptional activator TauR, can provide robust tuning of gene expression in diverse model organisms of the class Alphaproteobacteria, including members of Rhizobiales (R. leguminosarum Rlv3841, R. etli CE3, and S. fredii NGR234), Rhodobacterales (R. sphaeroides WS8N), Sphingomonadales (Z. mobilis ZM4), and Caulobacterales (C. crescentus NA1000). Import of taurine does not appear to pose a challenge, despite the absence of known or obvious transporters for the inducer in many of the organisms tested. P tauA and tauR, as well as other promoter regions described above, can be readily amplified from plasmids reported here and elsewhere , and cloned into other vectors that are more suitable for the end user. Therefore, this study adds to the repertoire of tools available for analyzing genetic models of Alphaproteobacteria. Because taurine has been shown to activate expression of genes other than those in the tau region, such as rpoE1 and rpoE4, in S. meliloti, the addition of taurine as an inducer may cause ancillary and potentially undesirable effects, particularly in untested organisms. Thus, appropriate control strains, such as one harboring an empty vector, should be included for comparison when examining the physiological consequences of inducing a gene of interest under the control of P tauA . In its native host, P tauA permits depletion of essential proteins and tight regulation of potentially toxic genes, especially if combined with careful manipulation of translational efficiency; specifically, Harrison et al. was able to reduce the level of expression from P tauA by modifying sequences adjacent to the ribosome binding site such that they form RNA secondary structures. Overexpression of the gene under P tauA control can be conducted in the ΔtauY background, in which inducer level remains high due to the inability to degrade taurine. Considering the ranges of expression observed, similar levels of control in other host organisms should be achievable with appropriate adjustments, including alterations of copy number via placement in the genome or on plasmids. The possibility of using the same construct to control expression in different alpha-proteobacteria can expedite examination of gene function across species: for example, we can use the same plasmid to determine whether an essential gene from one organism can complement null mutations in its orthologs. Although P tauA currently does not appear regulatable outside of the alpha-proteobacteria group, for instance in E. coli or Pseudomonas aeruginosa, further investigation and engineering may broaden the range of its functionality. Strains and plasmids used in this study are listed in Tables1 and 2. S. meliloti strains were grown at 30C in LB (1% tryptone, 0.5% yeast extract, 1% NaCl) , PYE (0.2% peptone, 0.1% yeast extract, 1 MM MgSO4; 0.5mM CaCl2 added only for liquid medium) ,, or M9 minimal medium , with antibiotics when appropriate: streptomycin (250 μg ml−1), neomycin (50 or 100 μg ml−1), gentamicin (20 μg ml−1), and oxytetracycline (0.5 or 1 μg ml−1). M9G contained 0.2% D-glucose as carbon source, M9 + CAA contained 0.2% casamino acids, and, for counter-selection against sacB, PYE contained 3% sucrose. C. crescentus NA1000 and its derivatives were grown at 30C in PYE or M2G media , with nalidixic acid (20 μg ml−1) and oxytetracycline (1 μg ml−1) when appropriate. (M2 minimal medium was supplemented with 0.2% glucose to make M2G.) Z. mobilis ZM4 and its derivatives were grown at 30C in RM or BM media , with nalidixic acid (20 μg ml−1) and kanamycin (200 μg ml−1) when appropriate. The original recipe for BM medium was modified by using yeast nitrogen base (YNB) without amino acids and ammonium sulfate (Difco) as the source of vitamins and trace elements. To make BM, we first dissolved and autoclaved 0.1g K2HPO4, 0.1g (NH4)2SO4, 40mg NaCl, and 2g glucose in 90mL water; after the solution cooled, we added the following filter-sterilized solutions: 0.9mL 10mM FeSO4, 1 ML 10mM Na2MoO4, and 10mL 10X YNB (1.7g YNB without amino acids and ammonium sulfate dissolved in 100mL water). E. coli strains were grown at 37C in LB, supplemented with gentamicin (1520 μg ml−1), kanamycin (3050 μg ml−1), or oxytetracycline (12 μg ml−1) when appropriate. All solid media contained 1.5% agar. Stock concentrations of casamino acids and various sugars were each 20% (w/v), while that of taurine was 0.5M. Mobilization of plasmids from E. coli to S. meliloti , C. crescentus, or Z. mobilis was accomplished by triparental mating, with the help of strain MT616, carrying pRK600 ; nalidixic acid or streptomycin was used to select against E. coli donor and helper strains. Electroporation of plasmid DNA into C. crescentus was achieved using cuvettes with 1-mm gaps and a Bio-Rad Gene Pulser II with the following settings: 400 Ω, 25 μF, and 1.5 kV . Deletions in the S. meliloti genome were generated by homologous recombination and allelic replacement, using a two-step selection procedure with the vector pJQ200sk ,. Plasmid integrations and genomic deletions were screened and confirmed by PCR. Construction of depletion strains required the presence of 100mM taurine in the medium while selecting for transconjugants. Standard techniques were used for cloning and analysis of DNA, PCR, and transformation into E. coli,. Plasmids and DNA fragments were isolated using commercial kits from Qiagen. KOD polymerase (Novagen) or MangoMix (Bioline) was used for high- or low-fidelity PCR amplification, respectively, while other enzymes used to manipulate DNA came from New England BioLabs. Elim Biopharmaceuticals provided oligonucleotide synthesis and DNA sequencing services. Details of plasmid construction are described in Additional file 1. Oligonucleotide sequences are provided in Additional file 2. We monitored expression of the uidA reporter, under the control of various promoters, by assessing beta-glucuronidase activities as previously described , except lysozyme was omitted and 400 μL 1 M sodium carbonate was added to stop each reaction. Enzymatic activity in each biological sample was measured in duplicates or triplicates, and measurements from at least three independent biological samples were averaged. For comparison of different promoters, S. meliloti strains were grown in PYE, LB, or M9 liquid media overnight, diluted to the desired optical density, and induced for three hours, to mid-log phase, with 0.2% (13.3mM) L-arabinose, 0.063% (5mM) taurine, 0.2% (11.0mM) L-rhamnose monohydrate, 0.2% (5.6mM) D-melibiose monohydrate, or 0.2% (3.4mM) D-raffinose pentahydrate. For induction in M9, strains were grown in M9 supplemented with 0.2% glucose (M9G), washed in M9 buffer without carbon source, and diluted into M9G or M9 plus inducer as the sole carbon source. For induction in M9 supplemented with 0.2% casamino acids (M9 + CAA), strains were either first grown in M9 + CAA without glucose and then diluted into the same medium with or without inducer; or they were first grown in M9 + CAA supplemented with 0.2% glucose, washed with M9 + CAA, and diluted into M9 + CAA supplemented with either glucose or the inducer. For comparison of melibiose and raffinose as inducers of P melA , strain JOE3334 was grown in PYE in the presence or absence of the inducer for three hours to mid-log phase, for 20hours to stationary phase, or for 12hours to mid-log or stationary phase, by diluting the starter PYE cultures appropriately. For induction with different concentrations of taurine, S. meliloti strains were grown for three hours in PYE or M9G to mid-log phase. For induction with taurine concentrations above 10mM in PYE, cultures were adjusted to the desired optical density by mixing appropriate volumes of the starter culture, 0.5M taurine, water, and double-strength PYE (2X PYE), to prevent excessive dilution of nutrients in the medium. Similar procedures were used to measure GUS activity in C. crescentus, except the strains were induced for two hours. To monitor mCherry expression in S. meliloti, we cultivated strains harboring pBBR1 MCS-2 or pJC514 overnight in PYE or M9G supplemented with neomycin (5 μg ml−1) and then diluted the cultures in media containing different concentrations of taurine, to a final volume of 0.8mL in each well of a 48-well microtiter plate. The plates were shaken for 20hours, and 150 μL of each culture was transferred to a 96-well optic plate in duplicates for absorbance (535nm) and fluorescence (550nm excitation, 610nm emission) measurements with a Tecan Spectrafluor Plus reader. Expression in Z. mobilis was monitored in a similar fashion, except the strains were grown in RM or BM supplemented with kanamycin (100 μg ml−1). For C. crescentus, NA1000 carrying pJC503 or pRVMCS-5 was induced in PYE or M2G (M2 plus 0.2% glucose) containing oxytetracycline (0.5 μg ml−1) and different concentrations of taurine for four hours. Absorbance readings confirmed similar levels of growth for all samples of the same species. Fluorescence readings were adjusted by subtracting the background fluorescence of strains carrying only the vector (pBBR1 MCS-2 or pRVMCS-5). Average background fluorescence readings (in arbitrary units) were approximately 10000 and 21000 for S. meliloti in PYE and M9G, 23000 and 30000 for C. crescentus in PYE and M2G, and 14000 and 22000 for Z. mobilis in RM and BM. Measurements of at least four biological samples, grown on separate days, were averaged following appropriate subtraction of background readings. MM, JCL, TS, JAB, ITG, TTT, SNK, ZH, and JCC carried out experiments and performed data analysis. MM, JCL, and JCC wrote the manuscript. All authors read and approved the final manuscript. We thank past and present members of the Chen lab for their technical assistance, Jeffrey M. Skerker for providing Z. mobilis ZM4, and Robert F. Fisher and Melanie J. Barnett for critical appraisal of the manuscript. This work was supported by the National Institute of General Medical Sciences of the National Institutes of Health (NIH) under Award Number SC3GM096943. JCL, TS, and JAB were funded by the following programs: NIH MARC (T34-GM008574), NIH MBRS-RISE (R25-GM059298), NIH MS-PhD Bridge (R25-GM048972), and the Genentech Foundation MS Dissertation Scholarship. Additional financial support came from the College of Science and Engineering, San Francisco State University. The content is solely the responsibility of the authors and does not necessarily represent the official views of the NIH or other funding agencies.